Here’s how to make your own botanical bookmarks from pressed flowers and decorative or handmade paper. These bookmarks are very easy to make and several can be made in a very short time. 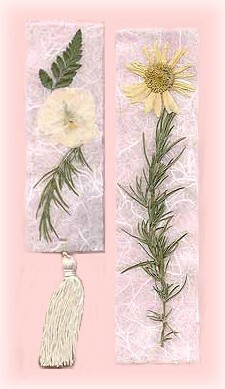 Arrange your florals as you would like them to appear on your bookmark. Try to keep your bookmark to a size no larger than 8 inches long by 2 1/2 inches wide. Once you are satisfied with your arrangement, cut a piece of decorative paper, and a piece of contact paper, that will accommodate your arrangement, plus 1/4 inch. It’s important that the edges of your bookmark be sealed with contact paper, so be sure to leave the extra space at the edges. Place your arrangement on top of the handmade paper and once satisfied, peel back your contact paper and gently place it over the entire paper area, sealing your florals between the decorative paper and the contact paper. Press firmly to seal all around the florals. If you would like to add a tassel to your bookmark, cut another piece of contact paper and attach it to the back of the decorative paper. This will give your bookmark the extra strength needed to support the tassel. If you decide not to add the tassel, cut along the edges of the paper area of your bookmark with decorative scissors. You don’t want any excess contact paper flowing over the edge. Punch a whole at the top center of your bookmark (I used a rectangle shape punch, but any will do) and insert a tassel, if using, and you’re all done. Sometimes, a little glue from the edges of the contact paper can stick to surrounding surfaces (such as the pages of a book). To avoid this, place your finished bookmarks between two sheets of paper towel and press in a phone book or add weight to the top. This will cause a small amount of paper towel lint to transfer to any sticky edges of the bookmark and prevent your bookmarks from sticking to the pages of your books later. for making pressed flowers that can be used almost immediately.